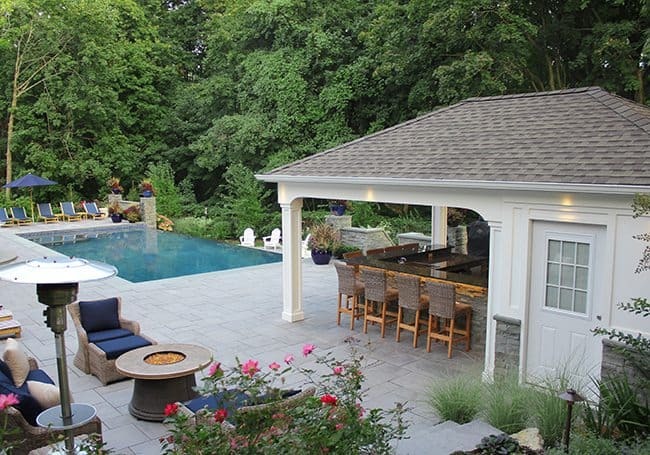 Redesign and completely refurbish the existing masonry patio and surround walls that were creating a constricting environment, and only offered limited space for proper entertaining. 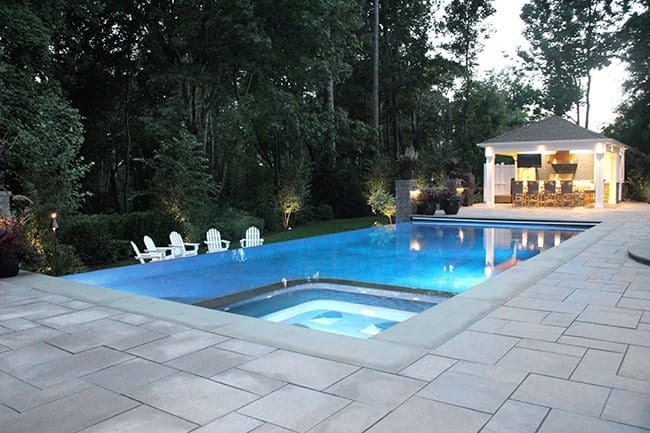 Marry a new patio, pool, and pool house, aesthetically, while maintaining the proper scale on the extensive property. Calculate load capacities, make drainage provisions, and design alternatives that would support the weight of the upper bluestone terrace, as it needed to be suspended above the underground garage below. 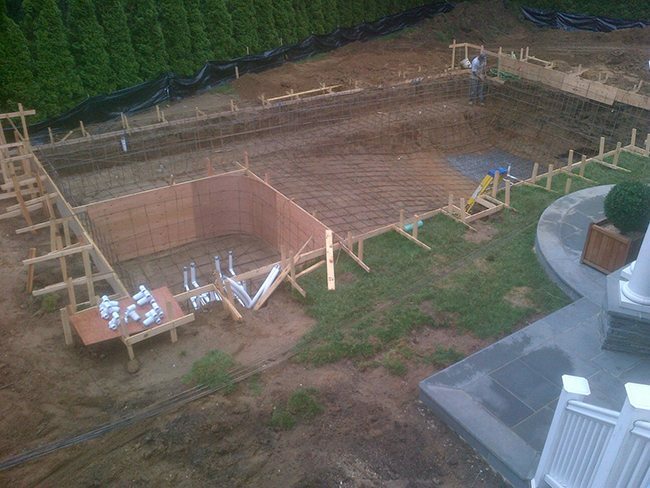 Locate the new gunite pool far enough away from the raised bluestone terraces, that they may be viewed panoramically from anywhere inside the house. 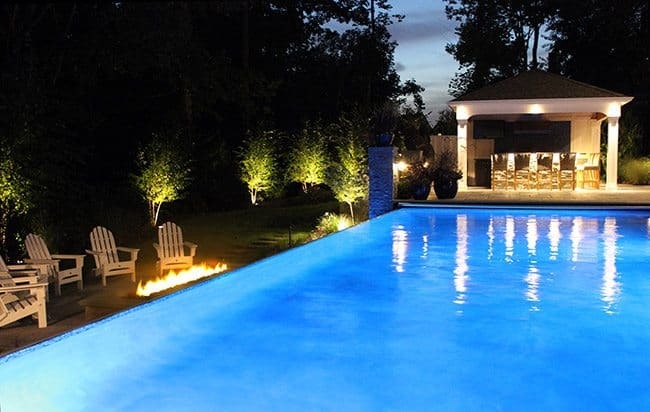 Locate the pool and cabana close enough to the house to keep that area from feeling disconnected and uninviting. 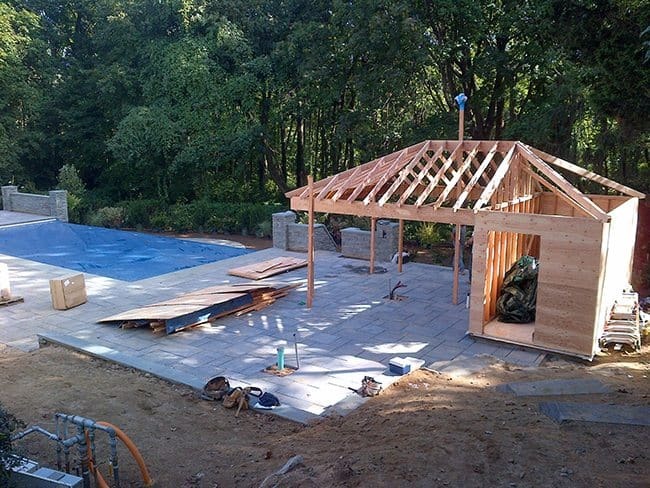 Provide shade to the raised patio while keeping sight lines clear out to the pool and expansive property. 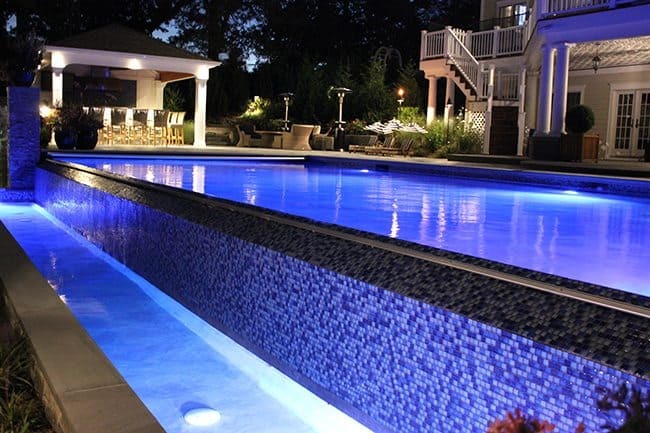 Integrate traditional materials such as Danish brick and bluestone to add warmer colors and textures to the new pool patio. 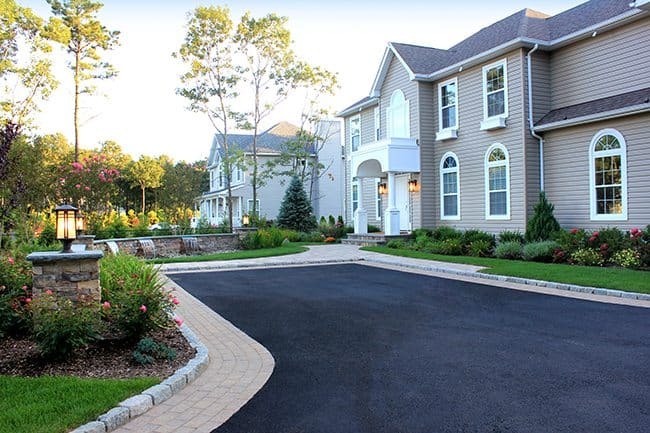 Upon entry up the steps leading from the driveway, you are greeted with an impressive and expansive view of the entire property. The new lower bluestone terrace provides a much needed space for cozy seating around a Gas Fire Table. 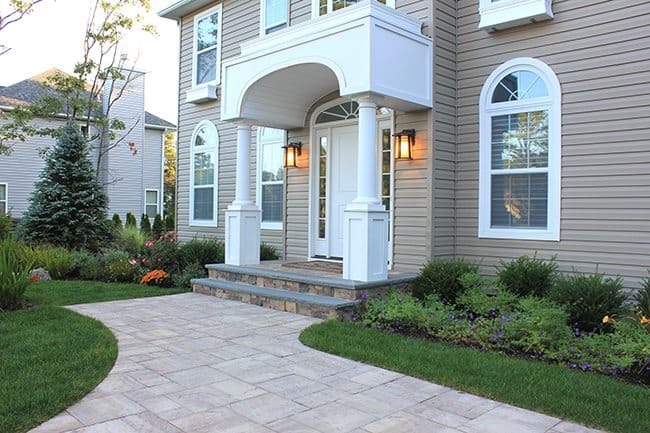 This area is defined and enhanced by a sweeping, circular bluestone inlay. The shape of the space allowed the designer to purposefully direct the orientation of the user towards the intended site lines. 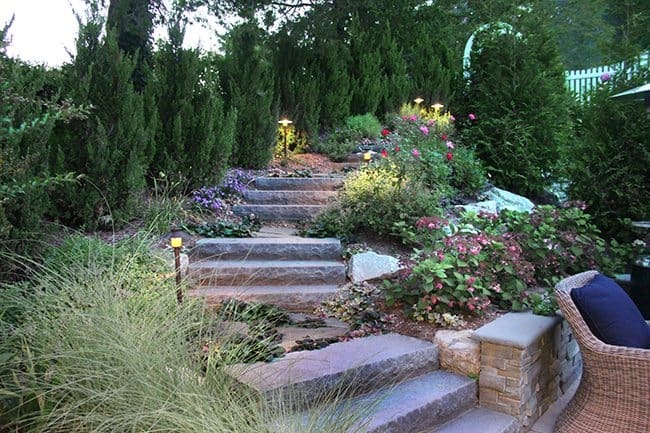 Graceful radial steps lead to the upper bluestone dining terrace, where oversized Danish brick pillars provide a wonderful spot for seasonal planting displays; the decision to install pottery was a great alternative to pier lights, as the glare from these lights (especially at eye-level) would prevent the viewer from seeing anything in the distance, such as the pool area. 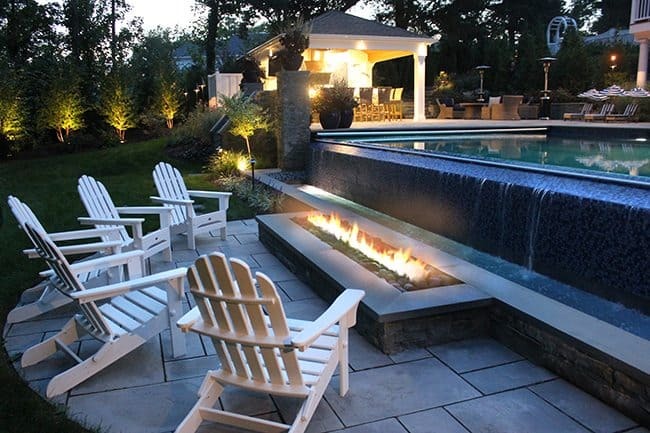 Pillars and seat walls were designed to frame the majestic view of the gunite pool, spa, water features, and custom cabana. This new bluestone dining patio culminates with a luxurious, 12 ft. tall outdoor wood-burning fireplace; meticulously veneered with a chiseled, stacked bluestone and contrasted with the simple clean lines of the bluestone trim work. To provide shade to this upper patio without obstructing views, we chose to plant three, 16 ft. Crape Myrtle “Muskogee” trees. The structure of the trees allows the canopy to provide filtered sunlight down onto the patio, while their actual trunk height maintains the important sight lines. The view from this elevated area onto the “Great Lawn” is now spectacular! Drink in the view while stepping down the grand “wedding cake” staircase leading onto a warm, “Travertina” paver pool patio. 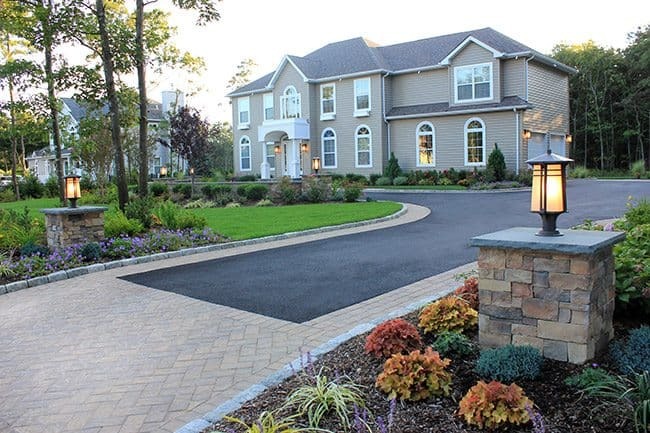 The Old World charm of this material is befitting of this stately manor home, where one overlooks the 24 ft. x 46 ft. free-form gunite pool with radial fullnose bluestone coping. 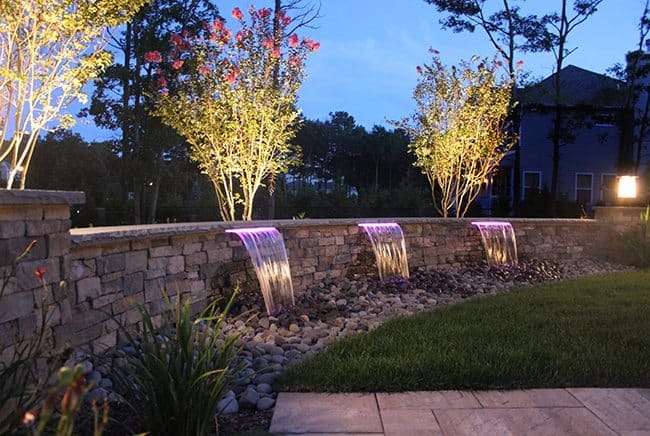 The client had requested a water feature that was subdued, but dramatic. They also wanted a dive rock to be accessible for their small children. As our original design called for a continuous wall of water sweeping around the deep end, this would not provide a safe elevation for the children to jump off from. Therefore, we chose to breach the wall with the dive rock and create two separate water features. The stone veneer on the twin sheer waterfalls and spa seem to emanate from well below water level. We achieved this look by continuing the stonework 6” below the water level, beautifully using the reflection of the water to deepen the effect. 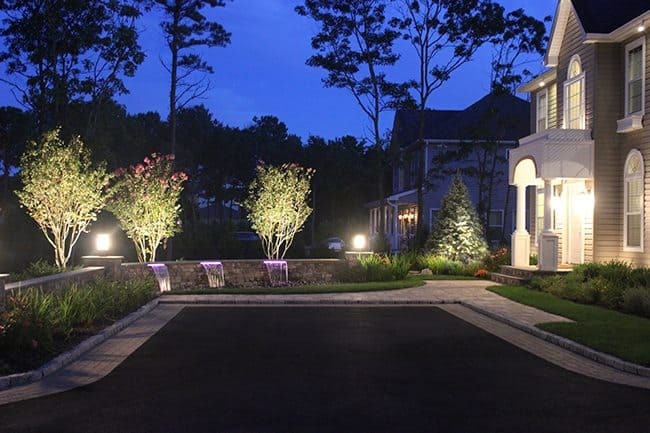 Both water features, pool, and spa can be controlled separately using the home’s “Smart System,” while LED lighting illuminates each feature independently in a dazzling nighttime display. 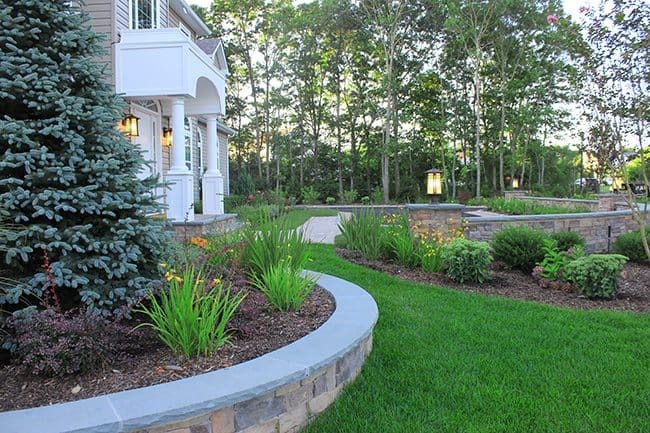 New plantings were designed to cleverly transition with the existing woodland edge. We thickened up the screening by staggering both mature and juvenile evergreen trees of similar variety to create the feel that Mother Nature herself had a hand in the process. Colorful deciduous shrubs, mixed perennials and ornamental grasses highlight the various depths of this grand landscape. Groundcovers were used in areas such as the path to the dive rock where we used ‘Blue Pacific’ Juniper and Geranium ‘Rozanne.’ In addition, we decided to hug this bluestone stepping stone path with a carpet of Ajuga ‘Burgundy Glow,’ which we chose as an alternative to mulch in order to naturally keep feet clean when entering the pool. 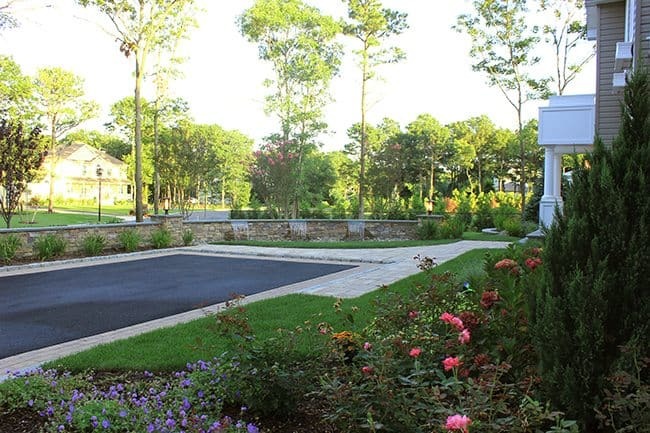 For this dramatic area behind the pool, three, 14 ft. ‘Thundercloud’ Plum trees were selected to provide a colorful backdrop throughout Spring, Summer and Fall. 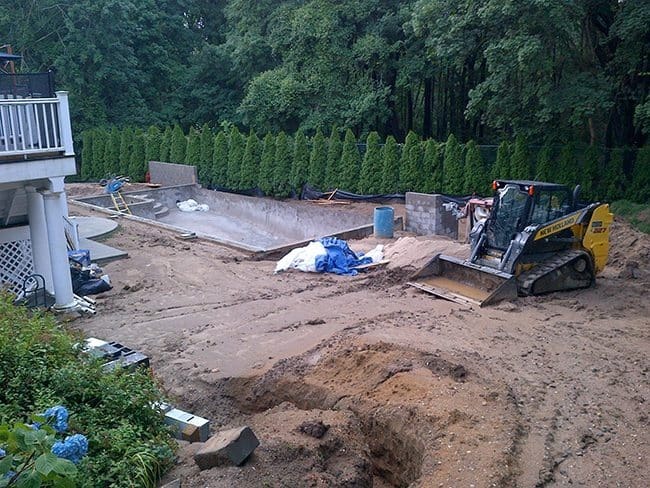 These large, specimen trees were hand dug so as not to disturb the elaborate underground highway of pool and electrical piping. Cited at the rear of the property to keep the great scale in balance, is the custom built cabana and pool house displaying fine architectural details and stonework, stained cedar ceiling and elaborate gabling that mirror the home’s design. 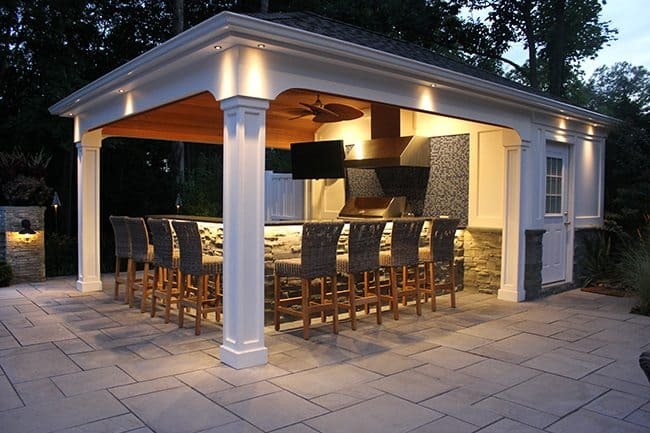 It boasts an outdoor kitchen and 9 ft. trapezoidal bar. This shape allows users on the far ends of the bar to see and communicate with one another, and feel like they’re part of the experience. The cabana includes: HDTV, indoor bathroom and shower, changing room, outdoor shower in the rear, and a highly developed lighting sequence. Now this big family — who loves to entertain — has everything they need to live their outdoor lifestyle to perfection! Sports are another activity important to them, so along with the new basketball court, a meticulously groomed, 5-hole synthetic turf putting green with authentic sand bunkers was professionally installed. 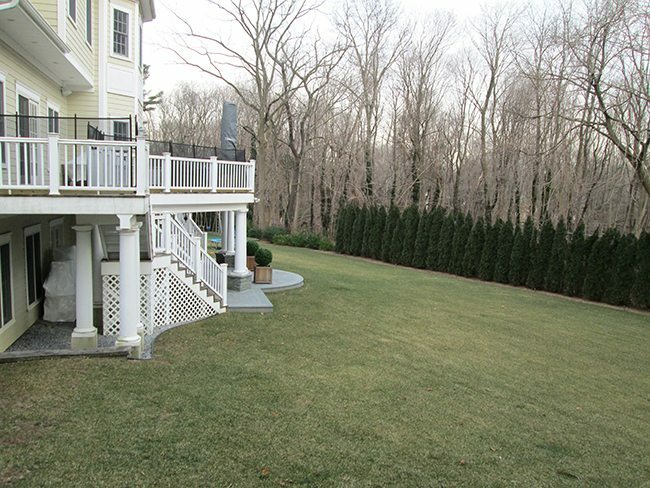 As per the homeowner’s request, we strategically placed nine, 10 ft. Arborvitae Plicata “Green Giant” for the golf enthusiast who may have a bad slice every now and then. 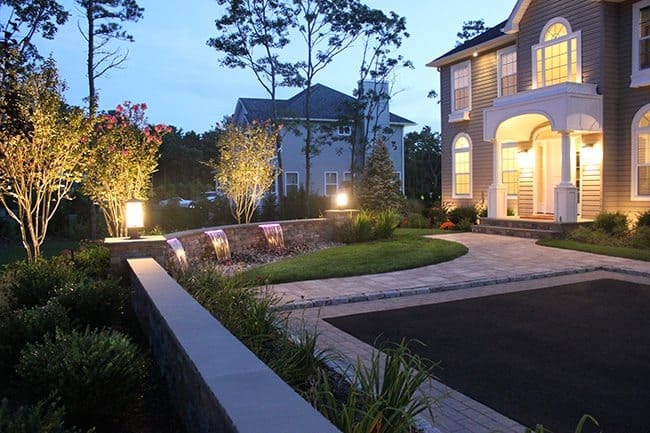 With expertise and patience, our professional approach overcame the complexities this design-build project demanded, and we are very proud to have had the opportunity to transform the landscape into a paradise for these appreciative homeowners!